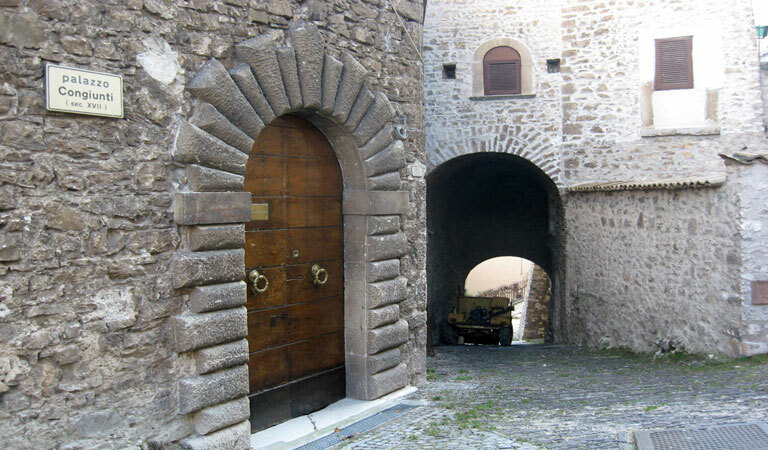 The XVII-XVIII century Sinibaldi-Congiunti Palace, connected to Porta San Pietro, which belongs to the earliest city walls, has two special rusticated portals and preserves traces of a Renaissance closed portico. 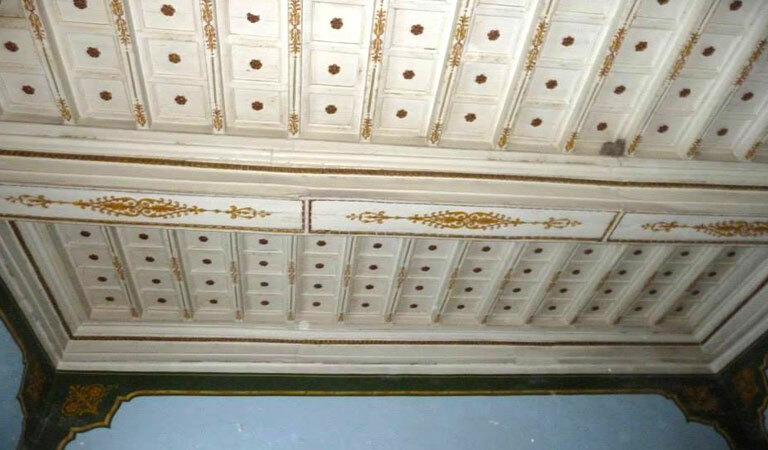 The interiors of the rooms are painted and decorated with wooden ceilings. 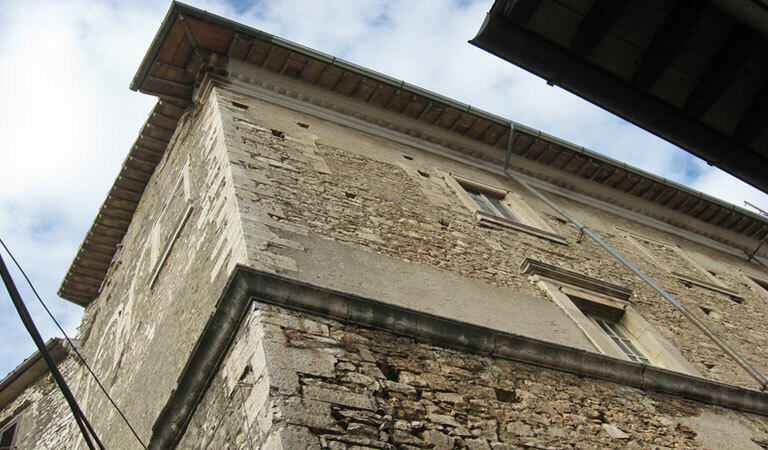 The Sinibaldi-Congiunti Palace is situated on the south of the oldest part of Monteleone di Spoleto, under the Church of San Gilberto and above Via Cesare Battisti, at numbers 10-16. The building of four floors is located on a former fifteenth-century plant (fully reused). It has an attached garden and follows the slope of the ground, forming a visible acute angle in the main facade, divided into three registers by belt courses. Born to be fully plastered, the façade is characterized by the beautiful portal with jambs and a rusticated arch formed by the juxtaposition of stones alternating height and width, chiseled to give it an appearance of roughness which contrasts with the soffit of the door and with two smooth stones set on the base of the entrance round arch. In the second and third register of the prospectus there are two types of windows: slender and entablature the lower one, smaller and linear the superior ones. 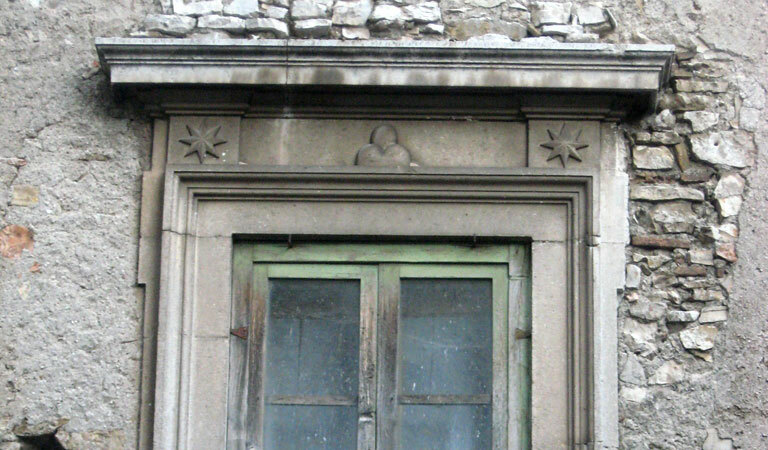 In the entablature of the first floor windows, there is a symbol in relief of three mountains at the center of two stars. It is a clear recall of the heraldic emblem of Sinibaldi family, it consists of three mounts and a star with eight tips (or, more precisely, a tripartite shield with blue, gold and silver band, with a gold star in the blue part and three green mountains in the silver one). The frame of the roof is composed of an indentation between two smooth moldings, while the corbels support the slightly protruding terminals of the cover. 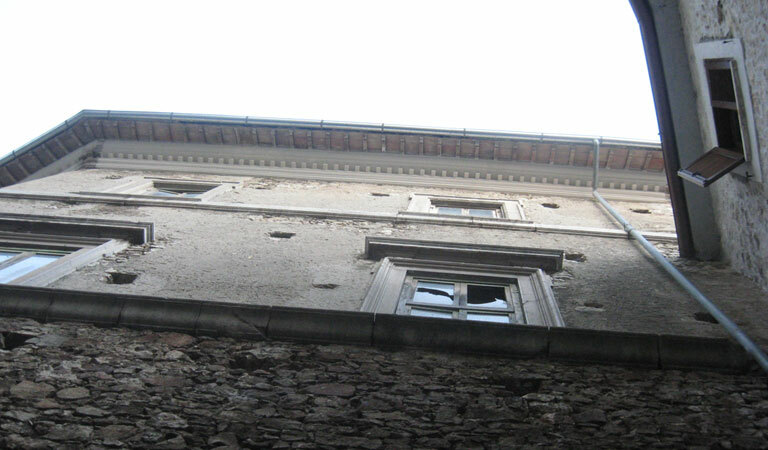 In the whole facade there are the putlog holes, originally used to support the scaffolding necessary for the construction of the highest parts of the building and used in the periodic maintenance. On the opposite prospect, situated in Via Cesare Battisti, there is another beautiful rusticated portal, decorated with three stars in relief. 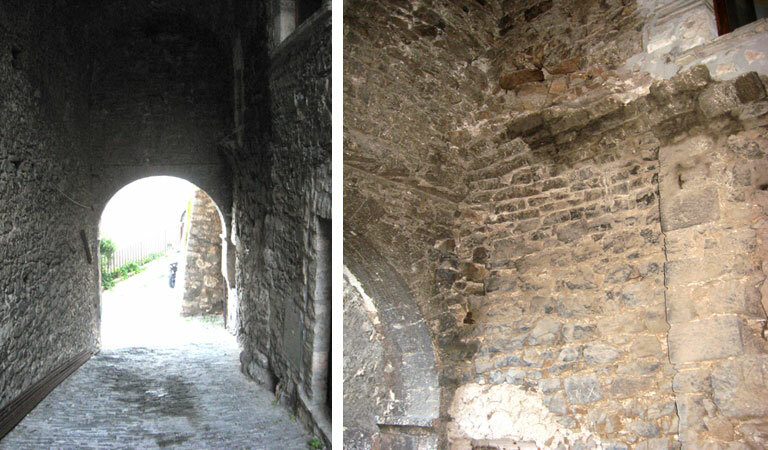 Above the belt course, there are the remains of some openings, more like arches of a Renaissance arcade (or roof terrace), then buffered and replaced by the windows of the same type of those present in the main facade. The interior, divided between several owners, have some rooms with paintings and decorated wooden ceilings. The palace is attached to another block through Porta San Pietro, linked to the homonymous church that is nearby. The Card. 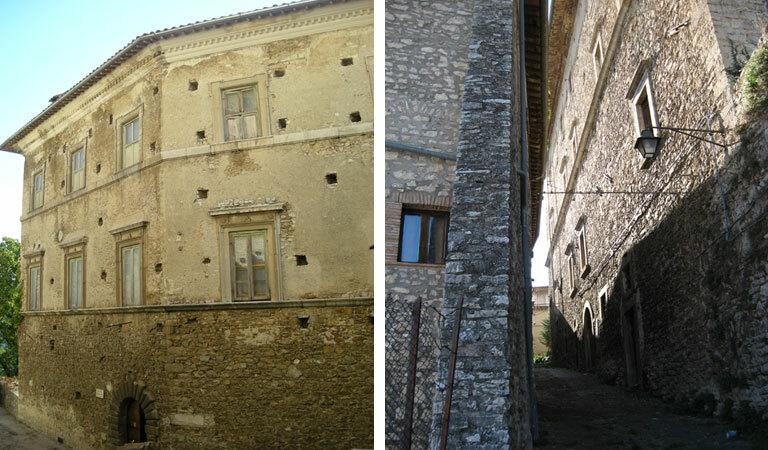 Eroli cites in 1465 a Church of San Pietro in Monteleone, that "is depending on Lateran Chapter and has the patronage in Monteleone "; Lascaris in 1712 indicates the same church as a simple benefit of Mr. Rasponi, "it is open and ruined" and thus in need of urgent renovation. Porta San Pietro is also explicitly cited by Antonio Piersanti of Monteleone in 1702: "(...) the whole Rione of San Nicolò, enclosed between two doors, one is near the tower where the clock is (...) the other is placed near the arch of San Pietro, which ends with the Sinibaldi palace”. 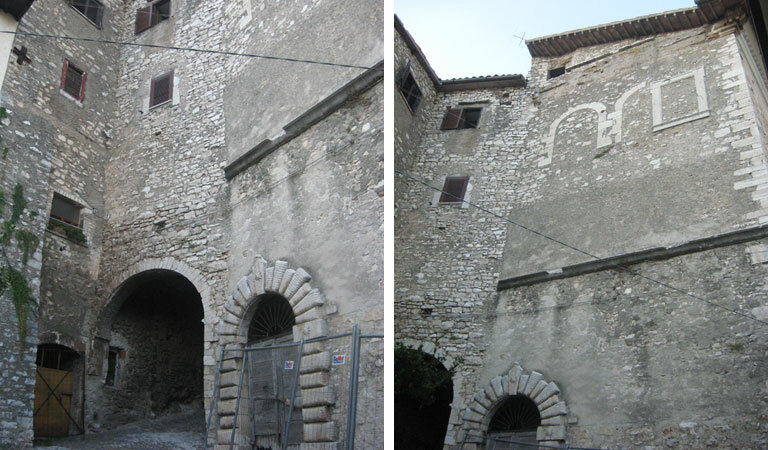 Belonging to the first wall of the village, Porta San Pietro is characterized by a simple and irregular stone covering, while inside there the oldest traces of the original gate tower. Sinibaldi family is one the richest and most noticeable family of Monteleone. It has been reported since the fifteenth century, with Sebastiano Sinibaldi from Monteleone, apostolic Commissioner and governor of Mogliano (MC) in 1569, while a P. Bartolomeo Sinibaldi (Franciscan) appears in 1613. Between the sixteenth and seventeenth century, a branch of the family has well integrated even in Rome, where the family has an economic interest and a palace at the beginning of Via Monterone, purchased by Giulio, who then leaves it as an inheritance to the sons Fabrizio, Amico and Cesare in 1698. The memory of this noble family, originally from Monteleone, is still attested in Rome, in the place names of Sant'Eustachio district, with Sinibaldi alley and arch of Sinibaldi. The Sinibaldi Palace is bought in the nineteenth century by the wealthy Congiunti family from Leonessa, who reached Monteleone di Spoleto in the early decades of the eighteenth century with Domenico, son of Francesco (Francesco Leonissanus). Antonio Congiunti, in the mid-twenties of the twentieth century, gives a personal bequest of £ 20,000 to a preschool, already established in 1916 by the primary school teacher Lorenzo Chimenti and which, since 1930, takes the official name of "Antonio Congiunti Preschool", situated in the former convent of San Francesco.